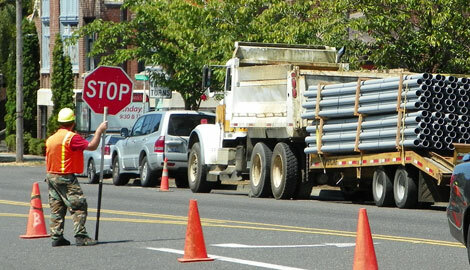 CenturyLink installs new phone lines with light rail construction in mind | Audio and video stories from Southwest Washington. Crews working on behalf of CenturyLink/Qwest install new equipment for high-speed Internet in downtown Vancouver. Despite the suspicions of some business owners, light rail construction has not begun in downtown Vancouver. However, the potential for light rail and streetcar development was a concern for CenturyLink (formerly Qwest) when it submitted a permit earlier this year with the City of Vancouver seeking permission to replace aging phone lines along Evergreen Boulevard between Daniels and Main streets this summer. The work has been underway for about a month and has included the installation of new manholes and vaults, conduits, and other infrastructure, according to city officials. Rumors about the work being connected to light rail construction emerged publicly last week when Main Street business owner Tom McCloud of Pip Printing claimed that crews working on behalf of CenturyLink told him they were moving lines to make way for light rail, a key component of the multi-billion dollar Columbia River Crossing Light Rail project*, which has not yet received approval. CenturyLink spokesperson Martin Flynn, however, said the work is not connected to the CRC, but rather CenturyLink’s efforts to improve its high-speed Internet service to the Vancouver area. He said CenturyLink is funding the project completely and that no city or county crews have been involved. Flynn declined to discuss specifics of the utility work and efforts to speak to CenturyLink’s lead engineer on the project were denied. However, based on handwritten notes on the franchise utility-street/right of way permit CenturyLink (then Qwest) submitted to the city, project engineers were cognizant of the potential for future transit construction impacting their work. The permit, dated May 3, includes handwritten notes specifying a minimum cover (or distance) of 36 inches from CenturyLink’s underground equipment to the surface of the street due to a “future streetcar.” A second note includes a shorthand reference to a light rail transit area, as confirmed by a city official. According to Loretta Callahan, the public information officer at Vancouver’s Public Works Department, the notes referring to a future streetcar or light rail are CenturyLink’s alone. She said city staff wrote notes on the permit pertaining only to restoration requirements for the job. “The drawings and design notes and references are all Qwest/CenturyLink’s,” she said in an e-mail. Callahan added that the “streetcar” notation on the permit refers specifically to a concept that members of the Vancouver branch of the American Institute of Architects shared with the Vancouver City Council during a workshop in 2007. That presentation discussed the role a streetcar system similar to the one in downtown Portland could play in fostering higher density urban development in Vancouver. Callahan says that Qwest/CenturyLink wanted information on any potential projects that might conflict with their new lines in the coming years, and that the city complied. However, she emphasized that no plans currently exist for streetcar development. Vancouver City Manager Eric Holmes weighed in on the rumor of early light rail construction during the Aug. 8 Vancouver City Council meeting, reiterating that this is an example of a private company making a business decision about future projects, including the CRC. Other links: Is light rail breaking ground in downtown Vancouver? If you have information on the CRC that you’d like to share anonymously, call the anonymous CRC tip hotline, 360-816-1426.